Moore County Schools Superintendent Dr. Bob Grimesey says the district will be undergoing some "organizational renovations," aimed at creating "a new culture of collaboration, trust, and respect." "The work of the Board of Education and Moore County Schools [MCS] will never return to its status quo, but will foster and cultivate a new normal," he said in a video released on Monday afternoon, June 29. The carefully-worded statement honored the unprecedented level of public outcry that was sparked by his recent termination — and that succeeded in having him reinstated. But it also expressed a determination that any changes the district makes "follows appropriate due process." Dr. Bob Grimesey from Moore County Schools on Vimeo. "After all, are we not the same Moore County community who spoke with a single voice so loud that it gained the attention of the entire state?" Grimesey asked. The public attention that was focused on MCS as a result of the dismissal of the Superintendent included substantial criticism of the role the Central Office staff plays in determining what is taught and how it is taught in the classroom. Recreation Director Mary Farley and Lakes & Dams Director Joy Smith have resigned from the Seven Lakes Landowners Association [SLLA] Board of Directors, President Chuck Leach announced during the Board's Thursday, June 11 Work Session. Farley was in the second year of her two-year term; Smith was elected to the Board in March. Leach encouraged anyone interested in serving on the Board to contact the Landowners Office. Continuing a debate on whether and how non-members should serve on SLLA Committees, Leach offered a compromise that he said would leave everyone unhappy. "I believe Seven Lakes has benefitted immensely from the advice, knowledge, and expertise of some of our long term renters," he said. "I also believe it is inherently wrong for a renter to sit on the Finance Committee and vote for a dues increase, that's not paying one penny in dues." Leach said he also felt it is "inherently wrong" for nonmembers to sit on the Judicial, Community Standards, or Architectural Review [ARB] Committees. He suggested the following policy: "Tenants and others who reside within the Seven Lakes community who are not landowners may participate in an advisory, non-voting on all the Board committees." Director Bob Racine pointed out that state law makes no restrictions other than allowing only Association members to serve on the Judicial Committee. "On all these other committees, they are advisory only," Racine said. "They advise the Board. We set them up. They report to the Board. I don't think we have to touch our rules and regulations or bylaws. They have worked in the past." "I think we are operating under the misapprehension that committees actually vote," said resident Mary Meyer. "Committees tend to get consensus." "I think saying 'non-voting members' creates a separation that we don't need in this community," she added. "We don't need to be exclusive, or exclusionary. We need to include people. There are committees that would suffer greatly, Recreation being one of them." Resident George Temple said the Finance Committee members did tend to vote on whether to forward recommendations to the Board. Leach argued that the Board tends "to go along with the recommendations of its committees." Jane Leach noted that the ARB does make decisions that impact a homeowner's use of their property, without first going through the Board of Directors. "The Board is the only group that has the right to make a decision," Resident Jim Allen said, "so a lot of the rest of this stuff is a red herring. You just had two people resign. You are having difficulty getting people to serve on committees." "How can a committee be representative when you exclude somebody just because they are not a member?" Allen asked. "I don't get it. It doesn't have anything to do with their competence." "You are missing a talent pool that is out there that is willing to serve and be excluding them I think you are doing something that is self-destructive." In the end, Leach's motion, that renters and other non-member residents of Seven Lakes North and South can serve in a non-voting advisory role on all committees except Judicial, was moved to the Open Meeting in a four-to-one vote, with Director Racine opposed. Late Friday night /early Saturday morning vandals broke bottles on the pool deck and defecated on the lifeguard stand. This required closing the pool. The pool will re-open at 3:00 pm on Sunday. The Association has zero tolerance for malicious damage to community property and facilities. A reward will be offered for information leading to the arrest & conviction of persons responsible for vandalism. It's important to report vandalism to correct the situation and prevent this from happening again. If you catch someone in the act of spray painting a building, stealing a sign, or otherwise destroying or vandalizing property, immediately call 911 and the North Gate @ 910-673-4938. Vandalism Costs… Ultimately, every owner pays the bills for damaged equipment, stolen signs, and vandalized parks. The Association maintenance staff has spent hours cleaning up graffiti, repairing buildings, and replacing equipment. The Moore County Board of Education plans to appoint another board member in a special meeting on Wednesday, June 17, filling one of three vacant seats. Chairman Bruce Cunningham told The Times that the Board's attorney, Ken Soo, has advised making the appointment as a precaution, to help ensure that the Board maintains a quorum and can legally take action. In the wake of Dr. Bob Grimesey's dismissal and reinstatement, four of the board members who voted to terminate his contract have resigned. Only one of those seats has been filled. The Board named former board member Pam Thompson to fill an at large seat in a special meeting on Thursday, June 11. Thompson will be sworn in during Wednesday's special meeting, scheduled for 6:30 pm at Carthage Elementary School. That will give the Board five members: Cunningham, Thompson, Ed Dennison, Charles Lambert, and Laura Lang. And five is the minimum number of members the Board needs to make any decisions. Attorney Soo advised that adding a sixth member would be wise, so a vote to do so is on the agenda for the special meeting. As the scheduled time for Superintendent Dr. Bob Grimesey's annual evaluation approached, former Board member Sue Black told The Times, it became clear, in private discussions among Board members, that a majority of the Board was not in favor of keeping him in the job. The Times interviewed Black via telephone on Saturday, June 13. Black, who resigned from the Board in the wake of the public outcry over Grimesey's firing, is not willing to talk about why his contract was terminated, but she was willing to talk with The Times about some of the events surrounding his dismissal — and how she believes they have been mischaracterized by the press and misunderstood by the public. 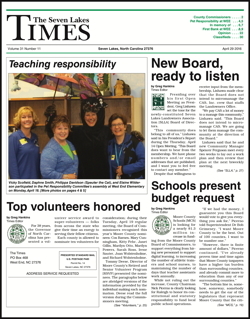 In particular, she disputes School Board Chairman's Bruce Cunningham's account, as reported by the Southern Pines Pilot newspaper, of a private conversation they had prior to Grimesey's ouster. As Board members began to work on the superintendent's evaluation, she said, they began to compare notes privately. "Board members get to talk among themselves outside of a Board meeting," she told The Times. And, in fact, nothing in North Carolina's Open Meetings Law forbids conversations among individual Board members outside of formal meetings. "Things like, 'Here's my experience, did you have this experience? '," she said. "That was particularly important for me, since I had only been on the Board this year." Though Black had served a total of eighteen years on the Board of Education in terms scattered over three decades, her most recent term began in December, so she had only about six months of experience with Grimesey. As the lack of support for Grimesey became clear, Black said, she felt it was important that all Board members were informed. "This happened to me when I was on the Board in 1987," Black said. "I walked into a Board meeting with no idea that the Superintendent was about to be fired." Black was recalling the firing of then-Superintendent Dr. Robert Tyndall, in a six-to-two vote of the Board. She was one of the two. "That's not a good idea," Black told The Times. "All Board members should be aware of what's going on." Three members of the Moore County Board of Education -- Kathy Farren, Sue Black, and Ben Cameron -- have resigned in the wake of controversy surrounding the firing of Moore County Schools [MCS] Superintendent Robert Grimesey. Farren, Cameron, and Black were among the five Board members who voted to unilaterally terminate Grimesey's contract during a special meeting on Thursday, June 4. Since the news broke on Tuesday morning that Grimesey's job was in jeopardy, there has been an unprecedented outcry of support for the Superintendent from parents, teachers, students, and political leaders. That show of support continued after the Board's vote to fire Grimesey on Thursday and was accompanied by an equally forceful public condemnation of the Board's action. On Friday, State Representative Jamie Boles obtained a temporary restraining order to prevent the School Board from hiring a replacement superintendent. Boles and Moore County's Board of Commissioners began to work on options for recalling the five members of the School Board that voted to fire Grimesey. The remaining members of the School Board will have the responsibility of filling the vacancies created by the resignation of Farren, Black, and Cameron. State Representative Jamie Boles has secured a temporary restraining order preventing the Moore County Board of Education from hiring a replacement for Superintendent Dr. Robert Grimesey, who was fired in a five to three vote in a special meeting on Thursday, June 4. In a press release announcing the restraining order, Boles called for the resignation of the five School Board members who voted to terminate Grimesey's contract: Kathy Farren, Ben Cameron, Sue Black, Laura Lang, and Becky Carlson by Noon on Monday, June 8, the date of the next Board of Eduction meeting. "I didn't want them to go in there and hire someone and handicap the decisions of a future Board," Boles told The Times. "And then that Board have to fire another superintendent and cost us more money." "This is not necessarily about whether Grimesey comes back," Boles said. "This is about moving forward in a positive direction." Boles said he is actively working on several options in the General Assembly that would provide Moore County citizens with the opportunity of recalling School Board members through a recall election in November. "If they won't resign, then the citizens need an option to recall them," Boles said. Moore County Schools Superintendent Dr. Robert Grimesey was fired in a special meeting of the Board of Education on Thursday, June 4. Despite considerable outcry from principals, teachers, parents, and even elected officials, Board members voted five-to-three to "unilaterally terminate" Grimesey's contract, and to pay for the $165,500 cost of severing that contract out of the district's fund balance. Laura Lang made the motion to fire Grimesey. With a second from Ben Cameron, it won the support of Kathy Farren, Becky Carlson, and Sue Black. Chairman Bruce Cunningham opposed the motion, as did Charles Lambert and Ed Dennison. In a separate motion, the Board agreed to hire retired Deputy Superintendent Larry Upchurch, a longtime MCS veteran, as Interim Superintendent. Upchurch's five month contract calls for a salary of $12,400 per month, along with a monthly $600 car and $50 cellphone allowance. Moore County's Board of Commissioners were quick to register their displeasure with the firing of Grimesey. Chairman Nick Picerno has called a special meeting for Noon on Wednesday, June 10 on the pending County budget — and on a potential recall of the School Board. Picerno told The Times that he does not believe taxpayer dollars should be spent on a $165,500 severance package, when money for classrooms teachers is in short supply. On the recall front, Picerno said State Representative Jamie Boles, who has also publicly expressed his displeasure over the School Board's actions, put the possibility of a recall on the table and provided the County Attorney with legal documents to review, so that she can brief the Commissioners on their options during the Special Meeting. "We have a couple of options," Picerno told The Times. "I don't know that we will do anything. But we may vote to proceed during next week's meeting." The called meeting is a Special Meeting, not a simple Work Session, so the Commissioners can take action during the meeting. The Moore County Board of Education has called a special meeting for Thursday, June 4 at 8:00 am, to deal with personnel matters. Based on anonymous sources, the Southern Pines Pilot newspaper is reporting that the meeting will focus on whether Superintendent Dr. Robert Grimesey's employment with Moore County Schools will continue. That reporting appears to be credible. Because it is a personnel matter, neither school personnel nor Board members are willing to comment on the record. Again, based on anonymous sources, the Pilot newspaper is reporting that the Board is split on the issue, with those in favor of retaining Grimesey in the minority, and that conflict with one or more senior Central Office staff members is the primary issue involved. The Special Meeting agenda includes no opportunity for public comment. The Board will discuss the matter in closed session; however, any action by the Board will have to be taken in open session. The question of whether non-members should be allowed to serve on committees of the Seven Lakes Landowners Association [SLLA] continues to spark debate among members of the community and the Board of Directors. President Chuck Leach made a motion during the Association's Thursday, May 28 Open meeting to "establish an administrative resolution to allow tenants in good standing to participate on the following four Board committees in an advisory, non-voting capacity: Facility and Grounds, Recreation, Security, and Lakes & Dams." Joy Smith seconded the motion; but, after considerable debate, Leach tabled it pending further discussion in the Board's Thursday, June 11 Work Session. Leach said he felt it was inherently wrong for a renter to "sit on the Finance Committee and vote for a dues increase, when that renter does not pay one penny in dues." He said he had similar objections to renters serving on the Judicial, Community Standards, and Architectural Review [ARB] Committees. "It is true that these committees are advisory," Leach said. "But, in most cases, this Board does follow the recommendations of our committees." The Board had been advised earlier in the day, via email, by its attorney, Roger Knight, that nonmembers can serve on "committees that are advisory only or as ex officio (non voting) members of committees." "What the Board should refrain from doing is allowing non-members to vote on matters that effect the ownership rights of members," Knight added.